So instead, I’m giving you this solid persimmon salad and a book giveaway. It wasn’t until I moved to California that I started eating persimmons and my first experience was terrible. I had no clue what to do with them and I decided to try a bit of one. I cut it into slices, took a bite, and my mouth dried up into the worst chalky taste. It was horrible and I couldn’t figure out what this devil fruit was. However, I did a bit of research and found that persimmons need to be eaten when ripe or else, you get chalky taste. These persimmons were just on the edge of ripe (even though they were so soft) but they worked for the salad. Ever since this arugula salad I’ve been on an endive/arugula kick for my salad base and a lemon dressing for salad (thanks to this curried potato salad). So when I heard Karen and Andrew had a vegetarian version coming out, I’d never felt so much excitement for a book (except maybe Harry Potter when I was in Junior High.) When I posted on instagram, I had a few people ask me what’s different. 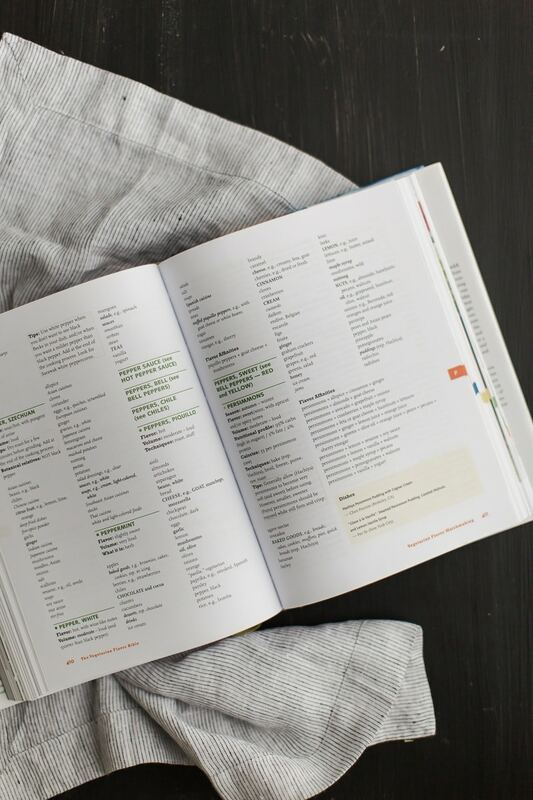 This book focuses on ingredients from produce, to legumes, and grains- everything I would already have in my kitchen. The book also has ideas for how the produce could be used (ie: for cauliflower, cauliflower rice is also mentioned.) Beyond the list of ingredients, there are flavor combinations from restaurants and chefs that gets you started and flavor profiles of different cuisines around the world. I love this book. And because I love it so much, I’m giving away TWO copies to readers today (think of it as my gift to you- I wish I could give everyone a copy!) Also, either of these books make a wonderful holiday gift! 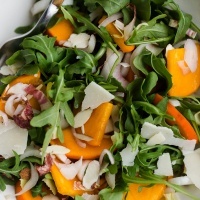 In a bowl, combine arugula, endive, shallot, persimmon, almond slices, and parmesan cheese. Toss to combine. In a small jar with lid, shake dressing together. Pour over salad and toss together. *If you can’t find vegetarian parm, use a substitute or leave out. I love the combo of lime and cumin! It looks so light and tasty! Perfect for a change from all the winter-heavy foods I’ve been eating. lemon.. with absolutely anything and everything! my favorite flavor combinations is curry and paprika! I love rich and smokey flavors. I just discovered the northwoods spice blend from penzeys (<3) and found that it transforms something simple like roasted asparagus into something amazing. I’m always a fan of sweet potatoes with curry. I love persimmon and can’t wait for my two trees to start producing them! I already have this cookbook on my list, it would be a wonderful Christmas gift! call me cliche, but salty & sweet is a combo i’ll never tire of! My favorite flavor combination? So hard to pick but feta + lemon is winning with me lately! I love to use lemon and dijon mustard! Thanks for a great giveaway. PS- the same thing happened to me the first time I had a persimmon when I moved to Sac. Turns out I had selected a Hachiya persimmon which is meant to be eaten VERY ripe or cooked. I have found the best for snacking are Fuyu. The recipe looks great, thanks! I love anything with jerk seasoning and lime. Yum! Ok, this salad looks so delish. I have a holiday potluck for my work on Saturday evening, I am making this! This looks great. I’ve been looking for ideas to use persimmons. I love persimmons! So hard to decide on favorite flavor combinations… lately been loving garlic, lemons, and parmesan. I love ginger. Ginger and garlic, ginger and mint, ginger and lemon… Also, you are a bigger person than I am when it comes to persimmon. Tried it once, felt like someone shoved a tea towel in my mouth and haven’t bothered again. I have been experimenting a bit. Recently I used agave and roasted garlic together to make a sauted cabbage! It was so yum! I love persimmons, although I hardly ever find them near me. This salad looks so wonderful & warming; actually a refreshing change from all the cookies as of late. My personal favorite flavor combo would have to be sea salt & chocolate. I’m a total sucker for anything salty on sweet. I keep seeing Persimmons in the store and I have no idea what people do with them. You’ve piqued my interest! One of my favorite flavor combos is sage and garlic. Love me some sage! I love to use fresh basil whenever I can! It brightens up everything…. buuuut my basil died about a month ago from the cold. I love combining ginger and cinnamon: cookies, smoothies, quick breads all benefit from some spice. Thanks for the giveaway. The salad looks yummy. I have never tried persimmons before but I am looking forward to it. One of my favorite flavor combinations is blue cheese and avocado! I love combining the tang and hint of spice of mustard with maple syrup. The savory/sweet balance is amazing on so many dishes. This is a gorgeous salad. I go crazy over persimmons and put them in everything when they’re in season. 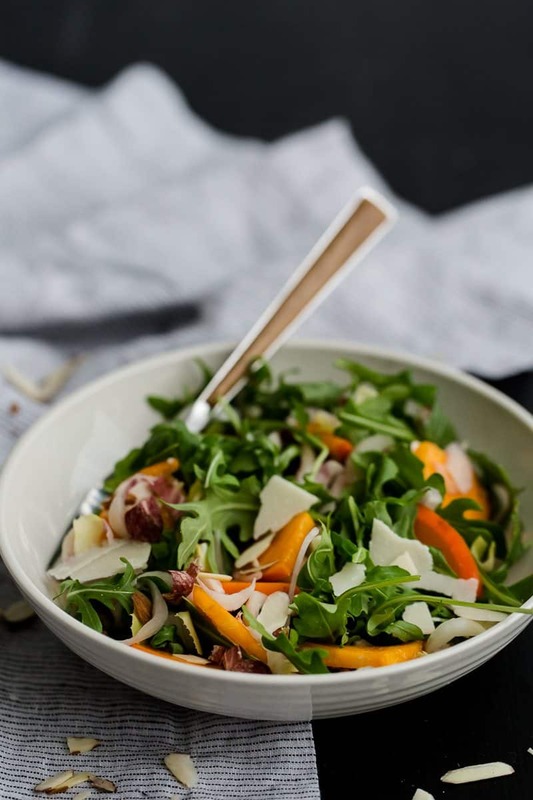 Will definitely be trying out this salad! Anything with sumac or curry is bound to get me in a happy mood! Yummy salad combo. I’ve been intrigued by the Flavor Bible. Ginger and garlic and lemon with anything are my favorite combos. This salad sounds absolutely delicious. Especially since I love persimmons. You know that the easy way around your persimmon problem is to use Fuyu (Japanese) persimmons instead of the Hachiya persimmons. Such a pretty-looking salad, Erin! My, it’s hard to choose just one favoured flavour combination, but given the time of year, perhaps I’ll say orange, cinnamon and cardamom – so warming! Lately my favorite flavor combinations have included anything with squash, sage, craisins, and pecans. I really love recipes that involve tomatoes and cumin. They usually have coriander, cayenne or chili powder, and sometimes even cinnamon, too! This salad looks incredible! My favourite flavour combination would probably be cumin and paprika. I love garlic so I combine it with almost everything. And tomatoes…whenever I can tomatoes get added to whatever I’m making. I love combinations with Dill – Dill and Cucumber, Dill and Yogurt, Dill and Carrots, Dill and Corn, you name it! I love lemon and citrus flavors. Cumin and smoked paprika. On everything savory! Ginger and garlic is one of my favorite go-to flavor combinations. I’m open to learning about more, though! I love cinnamon and cumin together. I really like cinnamon in more savory applications. 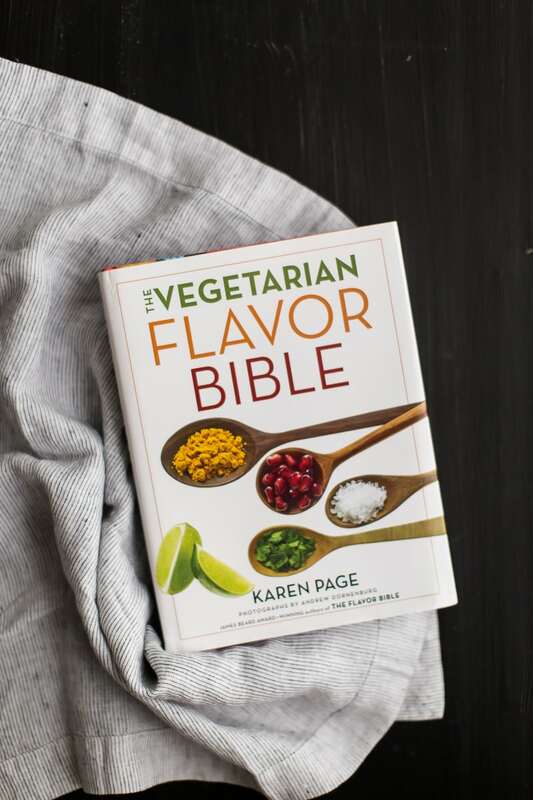 I got The Flavor Bible as a bridal shower gift and am now kicking myself that I didn’t wait a few months for THe Vegetarian FLavor Bible! 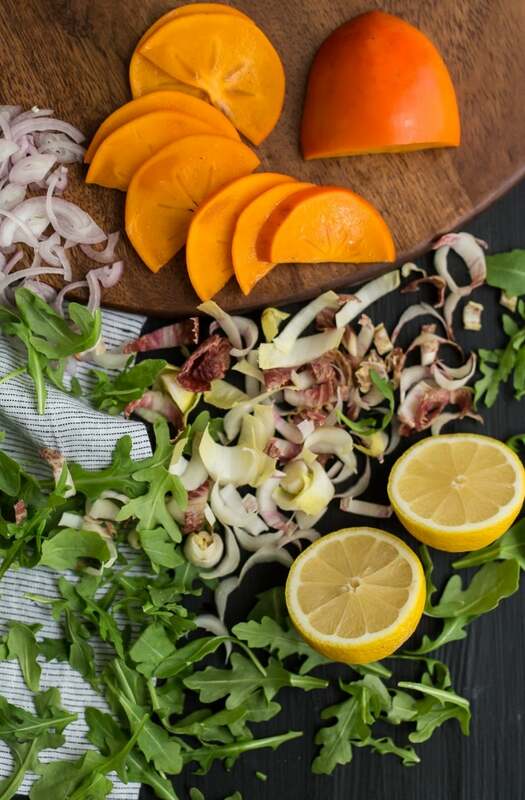 If this persimmon salad was inspired in any way by it, then I suspect it’s a winner. I love goat cheese and honey–Classic combo! I go through flavor combination crushes. Currently I’m digging (and trying to use any and everywhere!) cranberries, thyme, and mustard (sometimes horseradish). 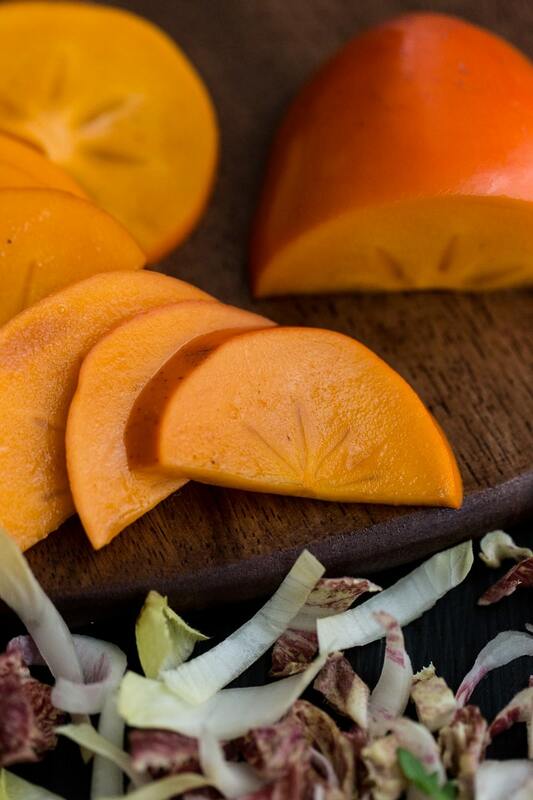 I just stumbled upon your blog and found this wonderful persimmon salad. 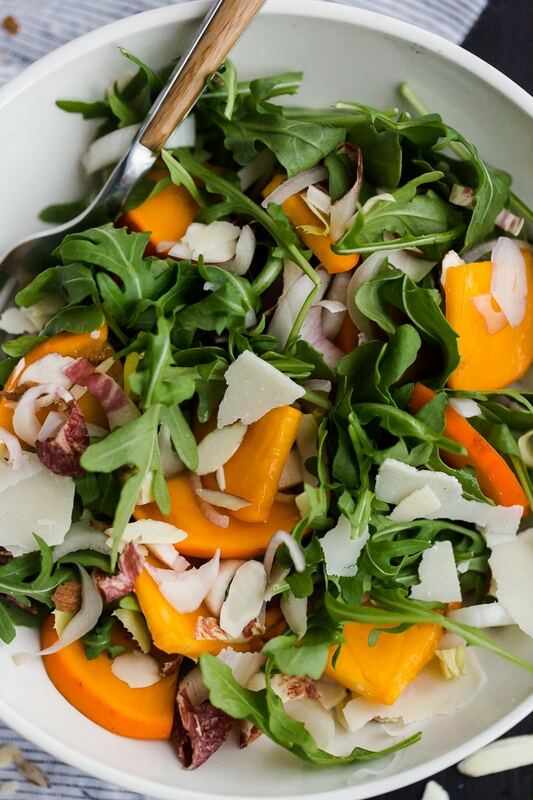 My husband loves persimmons and now I can surprise him with this salad – thank you for that!